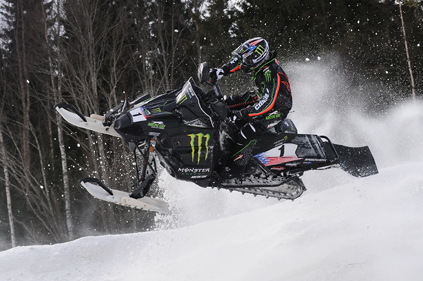 Tucker Hibbert wrapped-up a record-breaking snowmobile season Saturday in Finland with a third place finish at the FIM Snowcross World Championship. Hibbert consistently turned the fastest lap times of the day on the rough course in Tuuri but a drive belt failure in the second of three races took him out of contention for the overall win. Hibbert went 1-16-1 in the three-race format to finish third behind Sweden’s Emil Ohman and Petter Narsa. The first 20-rider, 15-minute race, Hibbert had a dead-last start and put on an impressive charge to take the lead with only minutes to go. He lined up for the second race confident and pulled a top-three start. Five minutes in, he moved into first but immediately knew something was wrong. Pieces of his drive belt began to break and fly off under the hood. Within moments, the belt completely shredded and he was forced to walk away from his snowmobile. He was not allowed to change the belt during the race because he was unable to get the snowmobile to the designated work area. Hibbert entered the third and final race knowing the Championship was out of reach but was determined to win. He got a mid-pack start and quickly moved to the front. By the end of the race, he pulled a 27-second gap on second place Ohman, giving him enough points for third overall. Once Hibbert returns to the U.S., he will shift his focus to preparing for select 450 AMA Pro Motocross Championship events. “I’m really excited about my performance at the World Championship. I don’t think I have ever felt so in control and confident in a race. Blowing a belt in the second race was disappointing but stuff like that happens – it’s racing. I can’t remember the last time I was taken out of a race because of a mechanical problem and that’s a testament to how solid my Monster Energy/Arctic Cat is and the talent of the crew working on the machine. It’s hard not winning the overall but honestly, I couldn’t be prouder of what we (the team) accomplished. We worked hard to get to this event and have no regrets. Just like last year in Sweden, I was overwhelmed by the kindness and support of everyone in Finland. The European racing community is fired up about snowmobile racing. It’s cool to see so many countries come together to compete. The growth of the sport and level of the competition just keeps rising. The future of snowmobile racing is looking good.